Most of my friends respect a good pour. That is when you are at a bar and you order a reasonably good drink and they give you a healthy amount of booze for your $$. The following picture is a prime example of a good pour. 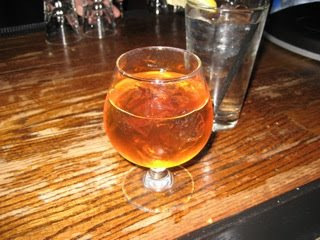 This is a healthy serving of woodford reserve bourbon, served to me at "no idea" or "don't know" in Fed Hill. Frankly I can never get the two places straight. That had to be four shots of whiskey. Hopefuly this will be enough fuel to hang on to Rick on the AM race pace ride. That reminds me, I am thirsty.